The problem with directors who base so much of their technique on being stylish is that eventually the novelty wears off and the viewers demand something more substantial. This is not to say that Tim Burton is incapable of some substance in his films; his characters are often quirky, but we can also empathise with them. However, his recent films haven't been so successful, with the low point for most people being his ill advised remake of Planet of the Apes. In some ways, Danny Elfman could be viewed along similar lines, but unlike his collaborator, Elfman has effortlessly developed the substance and in scores such as Sommersby and Black Beauty shown a level of maturity that his flashier efforts don't always display. In some senses, Big Fish is Elfman's least quirky score for Burton; it has plenty of whimsy, but doesn't overburden itself with a needless level of self conscious wackiness and so gets to the heart of the characters and story with effective, but far from banal, simplicity,. The album opens with songs that, with the exception of the newly written Man of the Hour by Pearl Jam (which is an enjoyable contribution), are all golden oldies. Pictures launches Elfman's score, but in truth it's little more than a delicate introduction to the Titles. There's something of the Thomas Newman approach here, not so much in the actual musical content (although there's a little cross pollination from time to time), but in the eclecticism of styles. Many of the cues function on their own terms and while there aren't drastic, random changes in direction, they don't directly relate to any of the other tracks. In truth, this isn't a great issue since most are delightful enough to work on their own, but Elfman doesn't seem to be building the themes up for a resounding payoff. The composer once said that if the audience hadn't grasped the main theme soon into the film, then he'd failed. By that reckoning, Elfman doesn't quite succeed with Big Fish, but as with most of his recent scores, repeat listens are very rewarding. The middle of the album is filled with vignettes that are disappointingly brief, but all this is turned around in the more substantial Finale which moves from playful action towards a melancholy conclusion before the End Titles. A brief concert arrangement of the gorgeously melancholy Jenny's Theme concludes the underscore. An hilarious song caps the album, performed in the film by Siamese twins and Elfman emphasizes this with an oriental influenced Broadway showstopper. Silly, but entertaining all the same. Like the story it supports, Elfman's Big Fish is something of a collage, but one that diffuses little elements of the composer's career into one delightful fantasy. That it's not quite the sum of its parts is a touch disappointing, but the elements - playful bluegrass, melancholy strings and choir, plus brief moments of exuberance - are still supremely enjoyable and, while his use of electronics has been deft and exciting, it's nice to hear Elfman returning to simpler (and I don't mean that in any pejorative sense), acoustic sound world. Not a classic, but delightful all the same. In my opinion, Danny Elfman has never written a bad score for a Tim Burton film. And while the composer's music for Burton's Big Fish isn't one of his absolute best efforts it is damn close at times. Many probably expected Elfman to write something like Edward Scissorhands for this film, probably because of the use of that score for the film's trailer. But Scissorhands was written fourteen years ago (damn, time really flies...) and Elfman has matured as a composer a lot since then and Big Fish is more of the new Elfman, than the old one, focusing less on grand themes and more on texture. So what is Big Fish like? Well, think of it as a blend of Elfman's music for The Family Man and other somewhat recent films with restrained Elfman scores, and Elfman in fairy tale mode. Yes, Edward Scissorhands actually comes to mind. The music has strong roots in Americana, and Elfman uses the fiddle in many cues, such as in the wonderful main title track. To this Elfman adds some lovely writing for strings and woodwinds, and his typical dreamy piano sound. Nice. Really nice. But it gets better. Many cues include some subtle celesta or glockenspiel and soft choir. "Underwater" is a highlight when it comes to soft, fairy tale music. More upbeat music can be found in tracks such as "The Growing Montage", which is an excellent three minute track, which starts out with soft choir and strings but ends with Elfman's typical whimsical choir and some absolutely great music performed by brass and percussion. Superb stuff. As is the eleven minutes long and very beautiful "Finale". So what about themes? 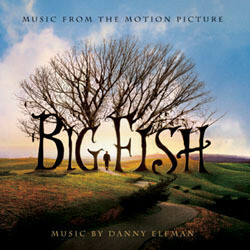 Well, although Big Fish isn't a typical big theme score, Elfman weaves in a couple of nice melodies into the score. And two of them appear in fuller, more complete versions in tracks of their own. There's "Sandra's Theme", a gorgeous little melody. And then there's "Jenny's Theme", also very nice, but a little more restrained. All in all, Big Fish is a lovely score by Elfman. Just don't expect it to be Edward Scissorhands 2, because it's not. But it's one of the better scores of 2003 and without doubt a keeper. The soundtrack album, released by Sony Classical, also includes classic songs performed by Buddy Holly, Elvis Presley. And the somewhat strange "Twice the Love (Siamese Twins' Song)" performed by Bobbi Page and Candice Rumph.